Social media. Instant Messaging. Video calling. Podcasting. The list of virtual communication gets longer day by day. But, email is still evergreen. Nobody can live without email. No matter what communication mode become mainstream, email would still be relevant. After all, Ascend2 has found out that 82% of B2B and B2C companies still use email marketing as part of their digital marketing strategy. So, getting your email marketing strategy is not just a ‘good thing’, but a must-have if you want to create a constant connection with your customers. But, how to do that? Your email list subscribers would be getting hundreds of mail on any given day. How to ensure that your email gets clicked, opened and read before invoking a response. We explain all of that in this quick article. Don’t send marketing emails on a Monday morning and expect people to click on it. They won’t, because, they will be busy with endless things to check their to-do list. According to Verticalresponse, the best time to send your marketing emails is Tuesday to Thursday in between 8 am to 10 am. There is also another study which claims that marketing emails sent on weekends have higher engagements. The study draws a conclusion from the fact that most people think about their jobs when not at their workplace. Anyways, we would rather advise you to stick with the weekday calendar since that is proven to fetch at least 20% and above unique open rates. The goodness of your subject line determines whether a user will open your email or not. Think of it as a bait to hook them and reel them into reading your mail. The length of your subject line, use of words, persuading tone, use of symbols, everything matters in getting your marketing email opened. 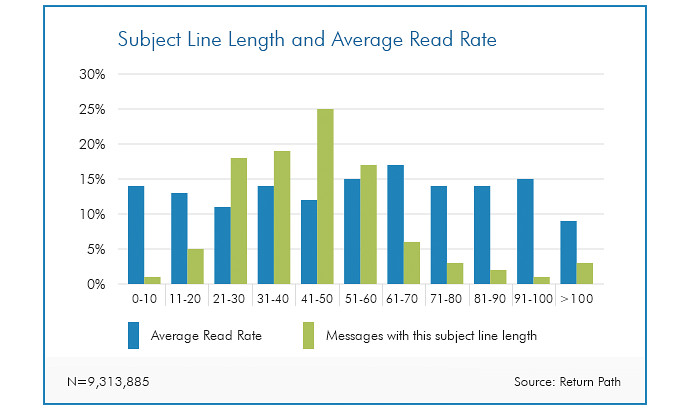 According to Campaign Monitor, emails with subject lines in the length range of 41 to 50 characters got the maximum click through rates. Also, there are other matters to consider like the visibility of the preheader and personalized email body. Targeting your customers with personalized emails like “Hello Sam, we know PetResort requires an image makeover.” connects with the customer directly. It prevents the situation where the reader feels like the email is written by a machine and sent by a machine. Personalization forges a human connection that leads to lead nurturing. Do you know? “Marketing emails are responsible for 70% of ‘this is spam’ complaints.” There is a big chance that your email will be classified as ‘spam’ if it does not fit some aspects relevant to email marketing. Use of spam words or phrases like buy, Earn $, Work at home, etc. Email marketing is the best way to reach your customers directly. Studies prove that there is a $44 RoI for every $1 dollar spent on email marketing. Should we repeat how huge it is? But, tapping into a potential market with email marketing doesn’t happen so easily. You need to strategize every pixel of your email so that it delivers what it is meant for and does what it is meant to do – convert readers into customers. When that is done, you not only have a customer for life but also would open up a series of other readers who turn into customers with a single click. That is the power of email marketing. We have scripted out some tactics you can use to make your email marketing click-through. Use them. Benefit from them. Good luck!